Farren House is located on a working farm where the principal enterprise is sheep, but there are also cattle and horses. It is a converted grain loft and stable, constructed with limestone over 100 years ago. The building has been tastefully converted to a comfortable living. You find yourself right in the heart of Ireland. 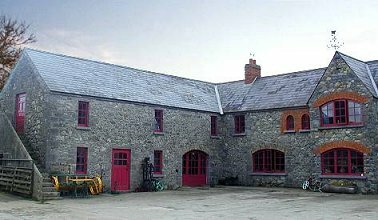 Traditional Farm Hostel offers en suite accommodation in 12 rooms for one to five persons. Some rooms have wheelchair access. During your stay you can make use of the fully fitted kitchen and the cosy, shared sitting room. Besides the hostel there is a small camp site where you can pitch your tent. Guests can make their own meals (vegetables are for sale on the farm), but can also enjoy a biological two course diner prepared by Marty and Wendy. If you want, you are welcome to assist them with the daily work on the farm. While exploring the neighbouring countryside, walking or biking, you may spot falcons and field birds. On the banks of murmuring streams you will see yellow broom and soft green moss. Fishing is possible on the rivers Nore and Barrow. In the northwest you will find the more desolate Slieve Mountains with their gloomy oak forests. The many historic houses in the area include Ballyfin House, Emo Court, and Durrow Castle.